ups: Great graphics. Ability to take cover changes game. Levels feel extremely open. downs: Few Co-op missions maps. Night vision nearly worthless. No cover in multiplayer. Since its introduction on the PC in 2001, the Ghost Recon series has kept the heart and soul of Clancy-based games intact. While the quality of Rainbow Six has fluctuated over its many iterations, Ghost Recon has consistently improved with every release. Now, with the premier of Ghost Recon on the first-to-market next-generation system, the trend is continued; Advanced Warfighter is easily the best the Ghost Recon the series currently has to offer. The appearance of Advanced Warfighter on the Xbox 360 should put to rest once and for all the myth that game design fundamentally changes with each console generation. Ghost Recon: Advanced Warfighter isn\'t any better for being on a console with prettier graphics. What makes Advanced Warfighter the Ghost Recon to own isn\'t the excellent graphics, but the detailed evolution in the gameplay itself. Additions like the ability to take cover behind walls and use the scouting drone are what push GRAW beyond Ghost Recon II. At the same time, modifications to the way the series controls, some odd design decisions, and a consistent neglect of co-operative missions by the development team keeps GRAW from receiving top marks. An outstanding single player presentation, combined with an excellent combative online experience, mix to keep GRAW squarely in the four star range. While graphics certainly don\'t make the game, it\'s impossible to see Ghost Recon: Advanced Warfighter and not be impressed by its artistic side. Lighting effects like high range lighting and pupil dilation throughout the game give Ghost Recon a graphical sheen and polish the series has never enjoyed before. Car explosions and smoke effects are really something to see; the extra time that Ubisoft gave themselves by holding GRAW until after the 360 launch shows in this regard. The mini-cam that shows you the perspective of your teammates while playing certainly adds to the experience but is basically without purpose; generally speaking, seeing what your teammates see is entertaining but too small to be of real consequence. Still, GRAW oozes with style, and the development team deserves a pat on the back for producing one of the best looking games yet to appear on the Xbox 360. My initial reaction to Ghost Recon: Advanced Warfighter\'s heads-up display was negative. The idea of a system automatically marking on a map the location of every enemy seemed too easy. In some respects, I was right, but not nearly as much as I had expected. Part of the new technologies that accompany your fighter have to do with gathering intelligence and using that intelligence effectively, and that fits well into the overall feel of the game. It certainly does not make it a walk in the park. Having the computer identify targets for you eliminates a bit of tension - you don\'t have to worry as much about being shot by an unseen enemy while crossing that open field - but leaves enough difficulty to keep things interesting. Plus, you can always turn off the heads-up display in the menu options, just like you can switch between first and third person to match your preferences. For all of its visual beauty, GRAW\'s most distinctive elements have nothing to do with the eye candy. Instead, it has to do with a greater emphasis on in-the-field tactics. For example, you can now take cover against walls, peeking your head out only to aim and shoot, if you want. While the addition of such a seemingly small element wouldn\'t seem enough to set GRAW out from its predecessors, the change in pacing and the change to how you approach a combat situation is significant. Add in the ability to control of a flying recon drone - a hovering disk that flies overhead marking where the enemies are - and what you find is that Advanced Warfighter is a different animal than Ghost Recon 1 and 2. Yet not everything in Ghost Recon: Advanced Warfighter is perfectly executed. The cover system, for example, has some issues. You take cover in Ghost Recon in two ways: facing a wall and pressing the right button, or walking into the wall for about half a second. The problem is the second method. Getting into and out of cover mode takes a moment, and while taking cover lets you look around corners without loosing any important appendages, it also restricts how far to the left and right of the wall you can look. Turning to face the street behind you, for example, means you have to take a half-second to disengage yourself from cover mode and look around. The problem is that it is far too easy to accidentally enter cover mode by walking into a wall at a slightly wrong angle. There were several times I died while being shot in the back simply because I couldn\'t turn away from the wall fast enough. The control difficulty isn\'t limited to taking cover; many things in Advanced Warfighter feel sluggish. The slight delay between pushing the zoom button and actually zooming in is annoying and gives the impression of being unresponsive. While the length of delay changes depending on what weapon you\'re using, there isn\'t really any reason for the delay at all. Some realistic elements make the game better, simulating what it would be like in real life, while others just slow things down and come across as flaws. The inability to adjust your turning sensitivity while zoomed is also a problem, since even enemies at a great distance are able to run away without much problem; you turn too slow while zoomed in to track them. Between the zoom and the difficulties with the cover mode, controlling your character generally feels sluggish when compared to Ghost Recon 2, even when so many other elements have been improved. While Advanced Warfighter\'s single player campaign is made up of an excellent and integrated string of missions, the Ghost Recon series has always been about playing both by yourself and with a friend. Here at GamesFirst, where we\'ve an abundance of like-minded gamers, Ghost Recon\'s co-op features have always kept it in the upper echelons of what we like to play. Sadly, GRAW\'s attention to the co-op element of the game is lacking, with only 4 co-op mission levels available for play online. Firefight allows for a wider variety with more levels, but suffers from a design flaw that\'s plagued every single Ghost Recon since its introduction. When you engage an enemy in Firefight mode, the sound of gunfire alerts the other enemies on the map and they come running. The ultimate result is that regardless of whether or not you\'re playing Firefight or some sort of defend your location mode, the result is basically the same: you stay in one location and wait for the flood of enemies to end. With the larger maps, this often means you\'ll play the entire level, kill every enemy, and discover you\'ve only seen 10% of the map. There\'s no need - and no opportunity - to hunt the enemy unless you restrict yourself to silenced weapons. The missions, however, don\'t have this problem. The enemy in one area will stay put until you arrive, forcing you to move in order to complete the levels. The result is that there are only four missions in Advanced Warfighter that are really co-op experiences that mimic the single-player campaign, and the lack of co-op love is extremely disappointing. The competitive online play is extremely well done, however. 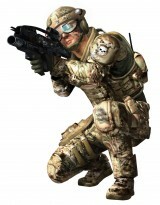 After you complete the single player missions and finish battling through the four mission levels with your friends, the experience offered on Xbox Live is competitive with any FPS on any system. Slight inconveniences like the inability to take cover in multiplayer modes and a near worthless night vision that\'s a step back from what you had in Ghost Recon 2 hardly interfere with how much you\'ll love the game. Ghost Recon: Advanced Warfighter offers hours of gameplay long after the storyline is complete. Since its release in November of 2005, the Xbox 360 has seen a fair share of good-but-not-great titles. King Kong, Perfect Dark, and Kameo were competent, but hardly the system sellers that many were hoping for. Now, with the release of Oblivion and GRAW in close quarters to each other, the Xbox 360 has gained its two strongest titles. Ghost Recon: Advanced Warfighter, despite it\'s lack of co-op love, is one of the most complex and well executed Ghost Recon titles to ever be made, and is certainly worth the attention of any gamer that likes the slow, tactical pacing of the Ghost Recon series. Despite its flaws, Advanced Warfighter is among the best that the Xbox 360 has to offer.